Blog Home / Events / Join Us for AVC! You’re invited to SparkFun AVC 2017: a smorgasbord of autonomous vehicles and combat robots built by students and hobbyists! 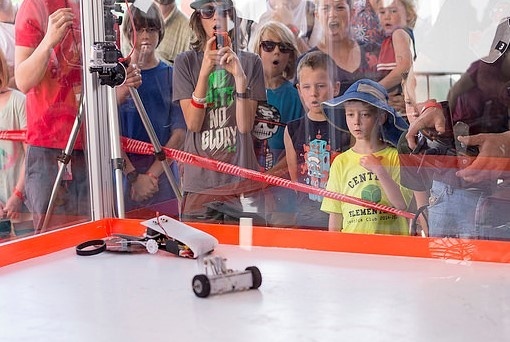 What once began as a bet between SparkFun founder Nathan Seidle and head of engineering Pete Dokter has now grown into a two-day competition that attracts student and adult teams from all over the country to try their hand at building custom robots. In 2009, Seidle challenged Dokter to build a robotic vehicle that could self-navigate around SparkFun’s Boulder, Colo., headquarters ... and a legend was born. This year’s event on October 14–15 includes competition opportunities for students to build autonomous vehicles and combat robots. Previous years have included autonomous drones, racing power wheels and one appearance from an old Jeep Wagoneer slowly driving itself around the race course. For SparkFun AVC 2017, we have two competition types: autonomous vehicles and combat robots. 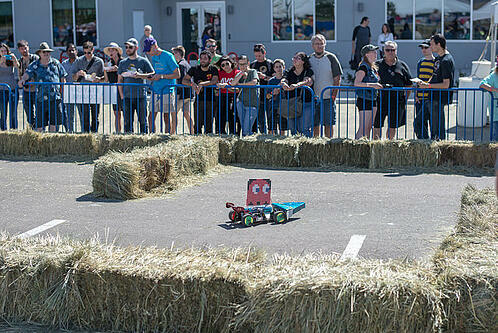 The vehicle competitions will focus on real-life applications of autonomous technology. We have three divisions: Logistics Class, Autonomous Car Wars and Speed Demons. The Logistics Class asks teams to experiment with a task-based competition designed around innovation in autonomous freight and trucking. The Autonomous Car Wars division is our first-ever AVC race inviting humans to ride their self-driving vehicles and play with semi-autonomous style cars. The Speed Demons race is this year’s iteration of our traditional AVC race focused on getting through the course as fast as possible and navigating unpredictable road hazards. The Combat Bot competitions will include the classic Antweight (1lb robots) and Beetleweight (3lb robots), which we’ve done in the past. However, this year we will be bringing a new 16’x16’ arena that will showcase matchups between Hobbyweight (12lb) robots and Featherweight (30lb) robots, the largest combat robot weight classes in the Rocky Mountain Region. Additionally we will be introducing a new class, Plastic Ants, a 1lb division where the robots are made almost entirely of plastic and 3D-printed parts. For K–12 teams, we recommend the Speed Demons division in the autonomous competitions and the Plastic Ants division for combat bots. Both divisions utilize smaller, less expensive builds and more easily accessible parts. The Plastic Ants combat robots competition is a great place to start for school teams that can leverage 3D printers and tools in makerspaces while incorporating robotics, programming and project-based learning opportunities. The Speed Demons division requires the least amount of technical acumen while still challenging students to not only build a robot, but build one that is programmed to navigate itself around a pre-defined course design. For undergraduates, we recommend the Logistics Class in the autonomous competitions and the 12lb and 30lb combat robot competitions. 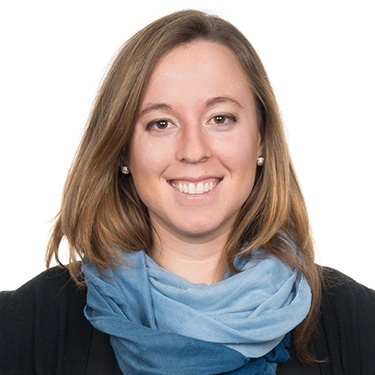 The Logistics Class gives undergraduate teams the opportunity to demonstrate their problem-solving skills with real-world enterprise-level challenges that require advanced programming and hardware expertise. The 12lb and 30lb combat robot competitions will match undergraduate teams up against some of the most advanced and renowned combat robot teams in the country. In previous years, SparkFun AVC has included teams from University of California–San Diego, MIT, Auburn University, Utah State University, University of Colorado–Boulder and Georgia Tech, among others. Registration for SparkFun AVC 2017 is currently open. At least two-thirds of student team members must be students (K–12 or undergraduate). The registration fee is $35 per robot or vehicle, which includes entrance to Denver Maker Faire, where the event will be hosted. 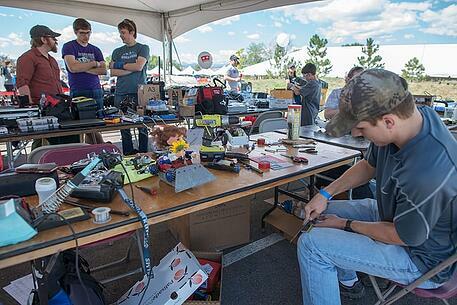 Student teams typically arrive the day before the competition (Friday, October 13) to test their vehicles on the course and make some last-minute (and overnight!) tweaks to their builds before competition officially begins on Saturday, October 14. 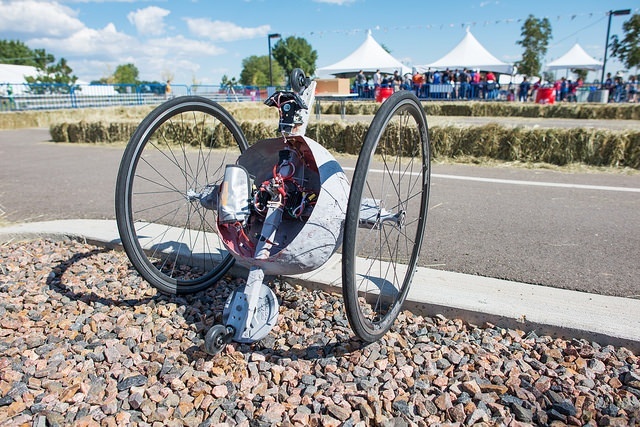 Denver Maker Faire, the largest maker event in the region, attracts nearly 10,000 spectators and attendees and offers many opportunities for students to talk to all types of makers and exhibitors. Please feel free to reach out with questions to avc@sparkfun.com.